The latest IMF review of the U.S. economy underscores the country’s resilience in the face of financial market volatility, a strong dollar, and subdued global demand. But the review also cites longer-term challenges to growth, including rising income polarization. Ever since the 1970s, the number of U.S. middle-income households, as percent of total, has been shrinking. The result has been increasing income polarization. For the three initial decades since then this polarization was more about households moving into the upper income ranks. However, since 2000, more middle-income households have fallen into lower, rather than higher income brackets. Combined with real income stagnation, polarization has had a negative impact on the economy, hampering the main engine of the U.S. growth: consumption. The analysis in our new paper suggests that over 1998–2013, the U.S. economy has lost the equivalent of more than one year of consumption due to increased polarization. The ancient Greek philosopher Aristotle observed that “the most perfect political community is one in which the middle class is in control, and outnumbers both of the other classes.” More than two thousand years later, most would still agree with that idea. 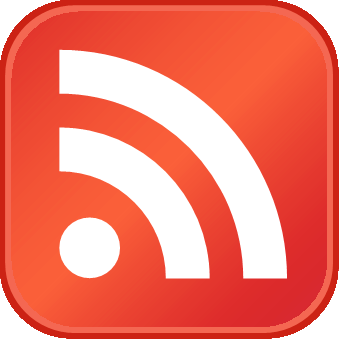 For all its importance, notwithstanding some studies in the 1980s and a handful of recent contributions, economists have fallen behind in documenting the progress being made by middle-income households, their consumption patterns, and other economic behavior. More analysis is needed on the economic policies that could affect middle-income households by spurring the upward mobility of low and middle income earners. Part of the problem has been that we do not have any stable conventions on how best to define middle-income households. Our work seeks to address some of these issues and energize this line of empirical research, focusing specifically on the movement of middle-income households up or down the income ladder, and the economic effects of these moves. While income inequality has attracted much attention, income polarization has yet to receive as much examination. There is a conceptual and qualitative difference between the two: income polarization measures the move from the middle of the income distribution out into the tails; income inequality, however, measures how far apart those tails are, i.e., what is the income distance between the low- and high-income groups. Middle-income households serve as a point of reference in any discussion of income polarization, and should, therefore, be well defined. Here, middle-income households are defined as those whose real incomes are within 50 to 150 percent of the median income. Households with incomes below this range are viewed as low income and above it, high income. Chart 1 shows that the population share of middle-income households has shrunk from about 58 percent of total in 1970 to 47 percent in 2014. Such a shift, in part, represents economic progress as roughly half of these households have been able to advance up through the income distribution, while the other half have moved down. Looking at the long trends, however, masks the deteriorating trends since the turn of the current century. While during 1970–2000, more of the middle-income households moved into high- rather than low-income ranks, since 2000 only a quarter of one percent of households have moved up to high income ranks, compared to an astonishing 3¼ percent of households who have moved down the income ladder (from middle to low-income ranks). 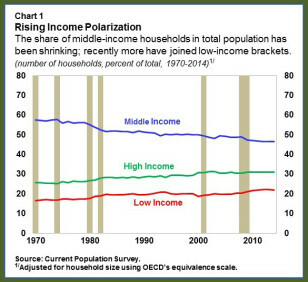 These polarization trends are robust to different cut-offs in defining the middle-income households. In addition, excluding households at the top 1 percent of income distribution or looking at households across age, race, or education still produces the same result. In addition to the polarization trends, it would be also important to look at the income shares of different income groups—a proxy for their relative weights in the economy. Chart 2 shows that income shares have also had a similar trend as polarization trends. The income share of the middle-income households, which was about 47 percent of total income in 1970, had fallen to about 35 percent in 2014. That decrease in the income of the middle-income households corresponds to the increase in the income share of the high-income households. Meanwhile, the income share for the lower-income households has remained flat over the entire period at around 5 percent of total national income. Low wage growth in recent years—partly a result of the drawn out recovery but also because of lower labor market dynamism—has also contributed to these trends. Income polarization, insofar as it disproportionately moves households toward the lower part of the income distribution, may have negative social and political repercussions and simply be seen as unfair. 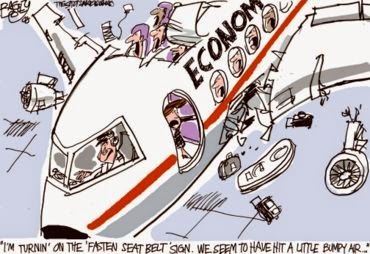 But polarization can also have important macroeconomic consequences. Low- and middle-income households spend a far larger share of their income than high-income households—to use economists’ jargon, the low- and middle-income households have higher marginal propensities to consume. 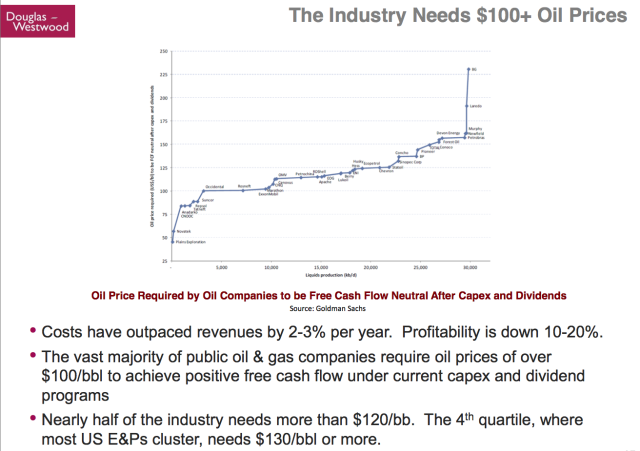 Therefore, any loss of income in these two groups has the potential to lower the U.S. economy’s aggregate consumption. Given the smaller propensity to consume by higher income groups, they can only provide a partial offset. To make matters worse, evidence suggests that, after controlling for income levels, the responsiveness of consumption to income gains for most of the income distribution has weakened in recent years. This puts further downward pressure on consumption. Combined, these effects are estimated to translate to about 3½ percentage points of lost U.S. consumption over 1998–2013—equivalent to more than one year of total consumption. To sum up: income polarization in the United States has seen a significant increase since the 1970s. While initially more middle-income households moved up the income ladder rather than down, since 2000, most of the increased polarization has been towards the low end of the income ladder. 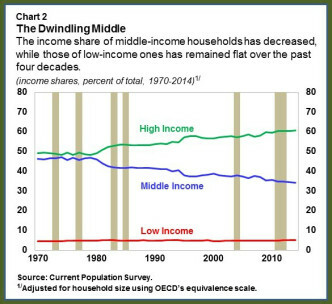 These trends, in addition to the well-documented income inequality trends, have led to a declining income share of the middle-income households. This has important macroeconomic consequences and merits receiving increasing attention and analysis in the coming years. Further research is needed to understand what are the root causes of income polarization and devise policies to mitigate the pattern, ensure the bulk of the population is achieving improved living standards over time, and tackle the social and macroeconomic consequences of polarization toward the lower part of the income distribution.